The legend of the Pied Piper tells of a man in pied clothing who is hired to lure rats from a town, but when the townspeople refuse to pay for his services, he retaliates by luring the children away from their parents with his magic pipe, never to be heard from again. The Pied Piper is a classic costume that has endured over the years and can easily be created by repurposing modern clothing. Purchase a pair of pointed, leather or felt shoes. Footwear from the era in which the Pied Piper story takes place fit loosely and came to a point at the toe with a slight curve up at the toe. A knee-high riding boot with a fold at the top of the boot works as well. Wear brown or colored tights on your legs. The tights should be completely opaque and not shiny or metallic. Stripes going the length of the leg work well, but avoid anything with a polka dot, horizontal stripe or other pattern. Tights that have a different color on each leg are ideal. Locate a colorful, oversized shirt in flannel, cotton or satin. Pied means patches of two or more colors, so look for a shirt with wide, vertical stripes in multiple different colors. Look for a shirt that is very large and loose, with sleeves that extend to your wrist. Find a large cape or robe, again, with multiple different colors. 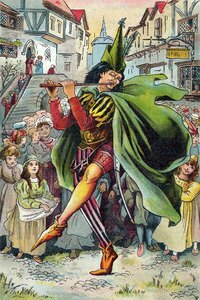 The Pied Piper is usually shown wearing a short cape that ends at the waist or a long robe or cape that extends to the ground. Tie a rope around your waist, covering your shirt and robe. Wear the rope under the cape, if you are wearing one. Pull a little bit of slack from the shirt or robe over the rope belt so that your top remains loose-fitting. Create the traditional Pied Piper hat by gluing a feather onto a hat. Use a fedora with a straight front brim, a pointed archer hat or a jester hat and use a hot glue gun to glue one long feather onto the hat on one side over the ear. Look for a solid brown hat or a multi-colored hat. Tie a pipe onto your belt by fastening it with a piece of string and looping the string around the rope of the belt. Carry plastic or stuffed rats or drag them behind you on strings to add even more authenticity.